With Christmas coming soon, it’s time to think about what are you going to cook and you might wonder what to prepare for you or maybe your vegan friends. There are plenty of easy and budget – friendly recipes to consider and in this article you can read about ten of them. From pasta salads to casseroles, there’s something about everyone! Here you can read about ten main dishes you can prepare and soon there will be another article about vegan desserts. Have fun cooking! The famous Wellington recipe can be easily adapted to the vegan lifestyle. Instead of beef, fill it with other tasty ingredients, such as mushroom, spinach and caramelized onions. You will also need a vegan puff pastry that you can either prepare it yourself or get a store – bought. 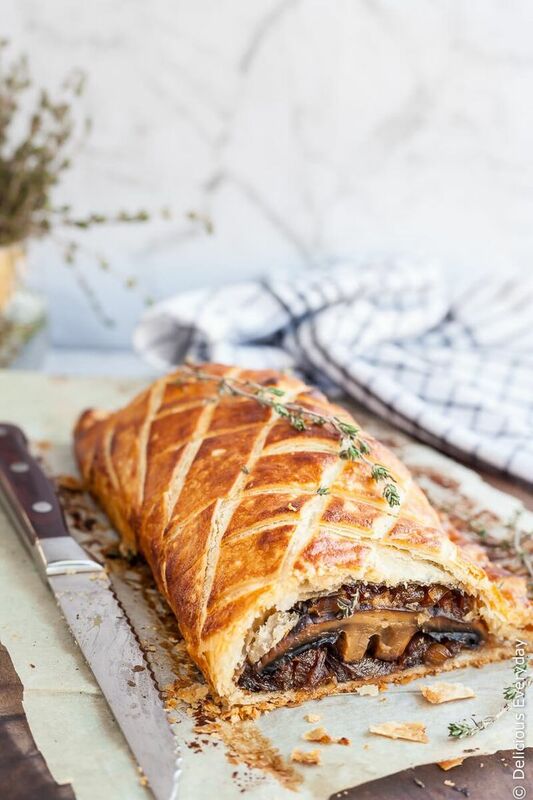 The mushroom Wellington is ready in an hour and it’s best to eat it soon after you take it out of the oven. 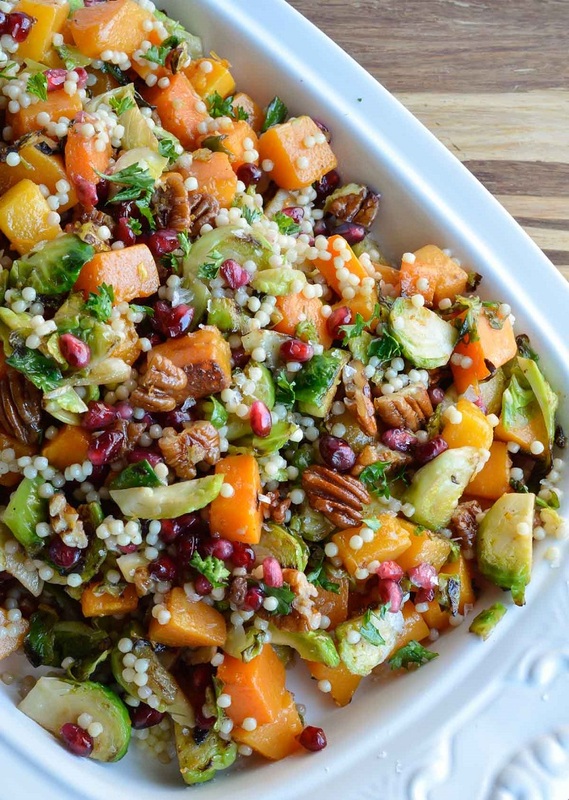 Have you ever seen a salad that is so Christmas-y? Unlike most salads, this one includes cutting the vegetables into matchsticks and that is exactly why this salad looks so good, besides the colorful look of the ingredients. 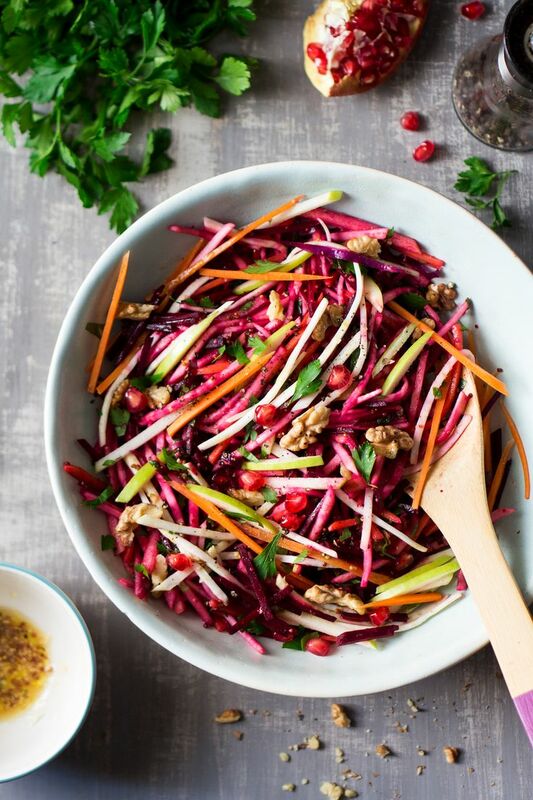 For this recipe, you need celeriac root, medium beetroots, green apple, 2 carrots, chopped parsley, chopped walnuts, pomegranate seeds and various dressings, such as wholegrain mustard, lemon juice and olive oil. 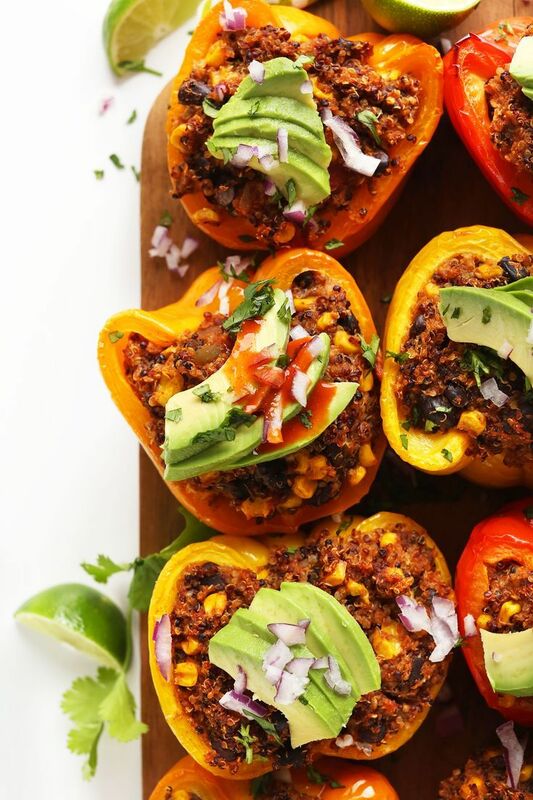 Bringing tastes from different cuisines for your Christmas dinner party is going to be an amazing idea and one of the recipes that you can prepare is exactly this one: Spanish – inspired quinoa stuffed peppers! The filling is made out of tasty ingredients such as black beans, kernel corn and quinoa, seasoned with different spices and herbs. You can serve these peppers with delicious toppings such as avocado, red onion or hot sauce. Salads can be dull side dish, but there’s an easy way to change that. Discard the usual salad recipes that you’ve heard thousand times before and go for something new! As much as we love tuna or Caesar salad, we have to say that this salad made of butternut squash, pasta, brussels sprouts, pecans and pomegranate is going to satisfy your cravings and make you go for more of it. Healthy and delicious! 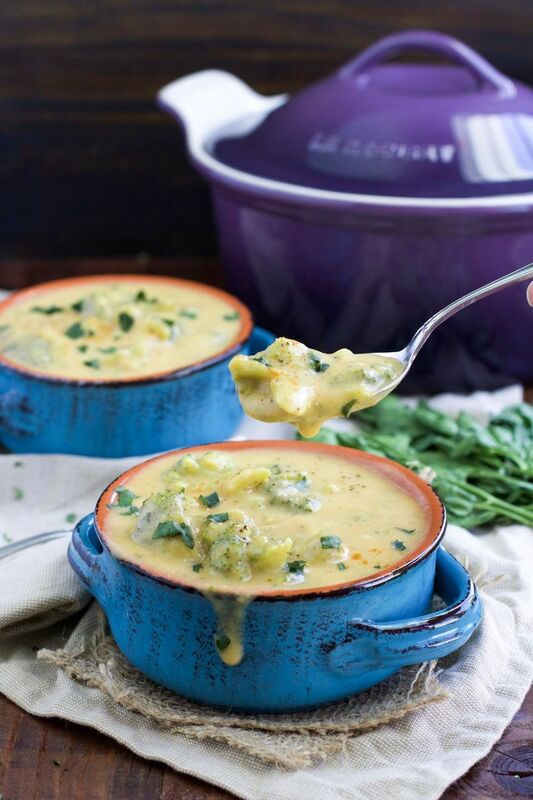 What’s better than warming yourself on a cold Christmas night with a bowl of creamy soup? This soup is the perfect mixture of different ingredients, such as cashews, potatoes and broccoli. It takes 40 minutes to prepare it and it’s best to serve it warm. What you’re going to like about this recipe is that one dish of the soup contains only 240 calories! 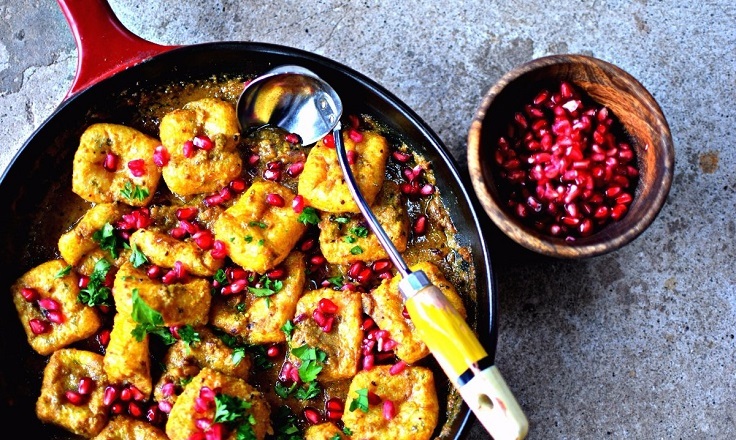 This recipe is actually a vegan version of a famous Persian recipe known as fesenjan. Instead of meat, the vegan recipe contains tofu. It is a seriously interesting mix of tastes, as it contains walnuts, pomegranates, couscous, onions and spices such as cinnamon and black pepper. it is very easy to prepare it! You can serve it with side dish such as baked potatoes. This is one of the easiest and most budget – friendly recipes on the list, as it requires only few ingredients – cauliflowers, olive oil, lemon juice, salt, black pepper and vegan cheese. You can also serve it with chopped chives as topping. 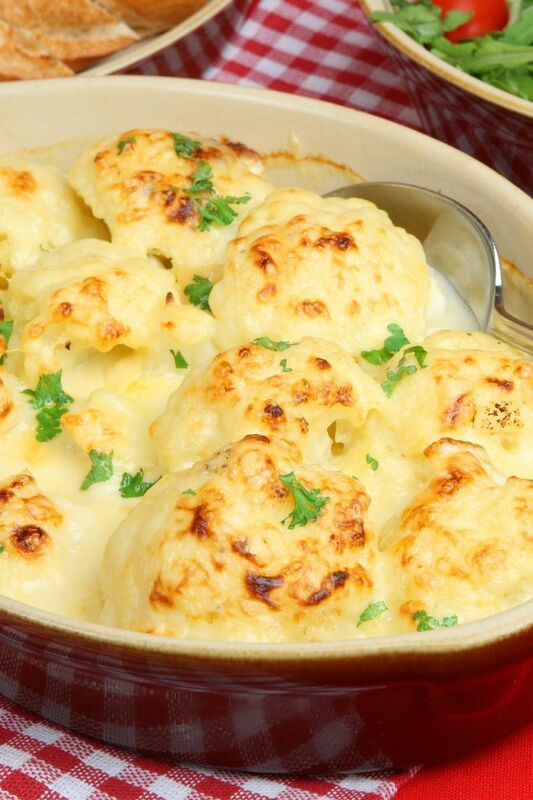 Considering the fact that the recipe contains cauliflowers, it’s not high in calories so you can indulge a little bit more! 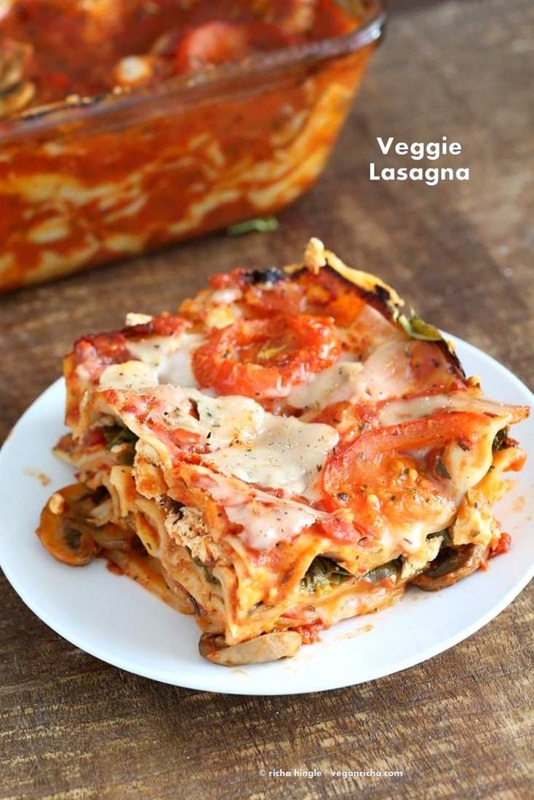 Forget the meat and the mozzarella – the vegan lasagna is as equally as delicious and it’s healthier! Imagine all things delicious and vegan in one meal – tofu thyme ricotta, vegan cheese slices, herbed mushrooms, tomato basil pasta sauce… Absolutely amazing recipe from the Italian cuisine, just adjusted to the vegan needs! However, we’re pretty sure that even meat lovers would like to try this lasagna. 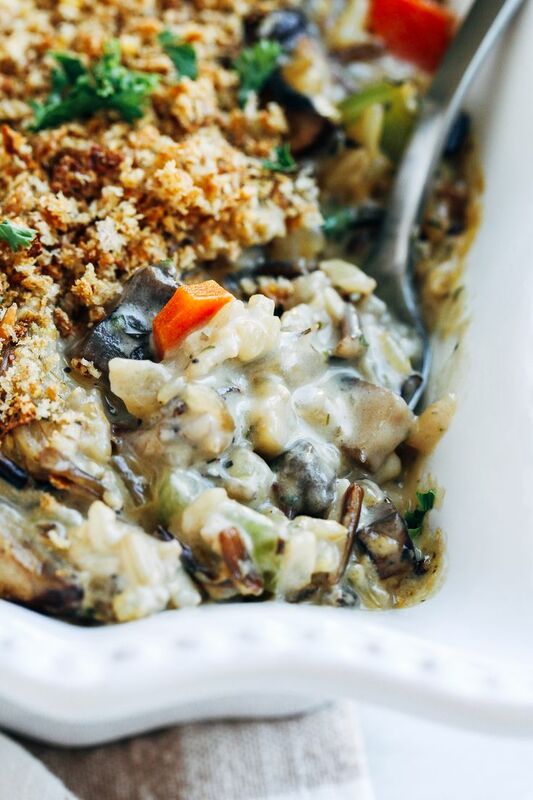 Casseroles are a popular dish for Christmas, so it’s no wonder why one of our favorite recipes is adjusted to be vegan! 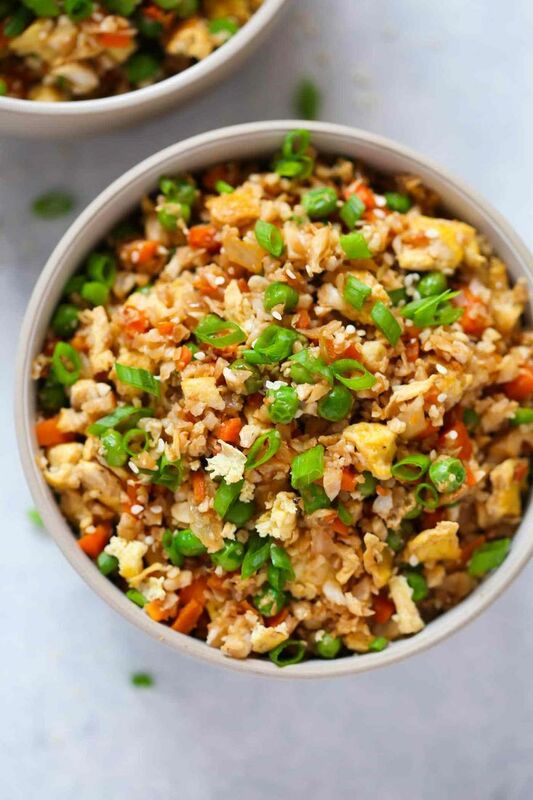 It will take you something less than two hours in total to have this casserole all done and ready, but all the waiting will be worth it in the end – it has the most delicious cashew sauce and many delicious and healthy ingredients, such as carrots, celery, mushrooms and onions, to name few! Can’t have enough of healthy meals? Here’s another one you’re really going to love, plus it’s ready in less than 20 minutes, which makes it ideal for those of you who don’t have much time or simply don’t want to spend hours of cooking. The stars in this recipe are the cauliflowers and the rice, accompanied with other tasty ingredients that together make this perfect Christmas dish!